We are delighted to announce the first recipient of The Thinking Vegan/The Pollination Project‘s grants for animal activism: The Save Movement, and co-organizer Anita Krajnc. There are 60 billion animals transported to slaughterhouses each year across the globe, yet few people notice, see, or hear these individuals. The Save Movement is a mass-based, grassroots movement to collectively bear witness at transportation routes and outside slaughterhouses around the world. By bearing witness as a community, we can demonstrate how each animal is an individual who wants to live and whom we ought to help. Why did we pick The Save Movement? Because we consider “bearing witness” an all-new tactic in animal activism. Traditional approaches like protests, petitions, feed-ins, leafleting, and legislation have been used for years, and we still don’t have that vegan world we have been working toward. It’s high time for a new tool. Bearing witness is peaceful, lawful, and makes an impact. And it all started in Toronto with Pig Save. Now, there are Save groups around the world including Guelph Pig Save, Windsor Pig Save, London Chicken Save, New York Farm Animal Save, Melbourne Pig Save, and Melbourne Chicken Save – more than 20 organizations in Canada, the U.S., and Australia. We spoke to Anita about the organization and its plans. Q. What’s your goal for The Save Movement? Our objective is to help create a mass-based, grassroots movement to bear witness of farmed animals in transport trucks and slaughterhouses. This local and regional project of animal justice activism began at Toronto-area slaughterhouses. Toronto Pig Save was the first example and is a blueprint for how to organize well-attended, grassroots vigils to bear witness effectively at local slaughterhouses in other communities. Our ultimate goal is for all people to bear witness to all the individual farmed animals sent to slaughter, until this horrific injustice ends. We use a resolute, Tolstoyan and Gandhian love-based approach to community organizing, and a community organizing approach where everyone is a leader and a good leader brings out leadership qualities in others. We plan to develop tools and tips for vigils, signs, banners, leaflets, stickers, buttons, etc., that other activists can download from our new website to print; create a directory so people can find a vigil near them; tips for working with local media; and a collection of photos and blogs about peoples’ experiences of bearing witness all around the world. I adopted a dog, Mr. Bean, for my mom in late 2010 and started walking along Lake Shore each morning and witnessed an endless stream of transport trucks carrying pigs to “Quality Meat Packers” slaughterhouse nearby. I was aware of the slaughterhouse, since I lived in the vicinity-within a one-kilometer radius-for a few years, and on several occasions approached other activists, asking if they could organize a protest. But once Bean and I started seeing seven or eight pig transport trucks each morning, the idea of starting Toronto Pig Save was born. 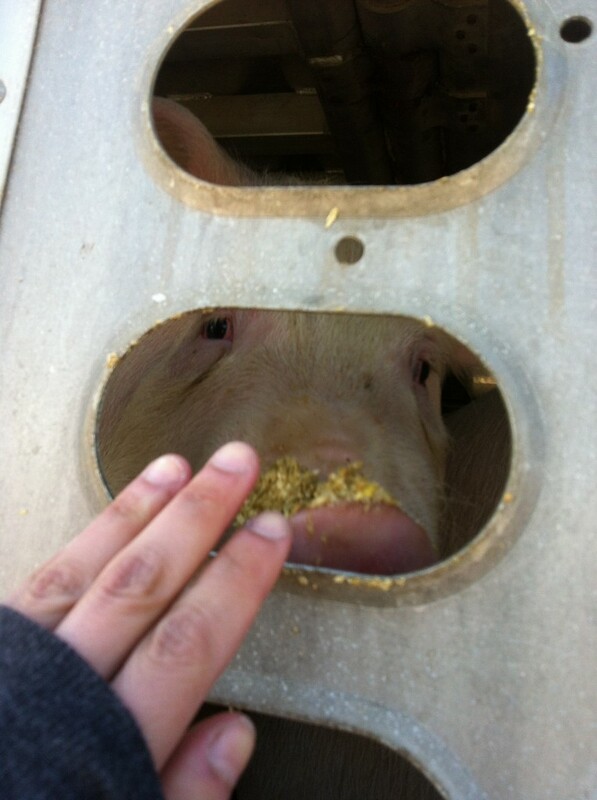 Within a half a year, we started doing three weekly vigils each week – a promise I personally made to the pigs, the first time I walked up close to a truck and looked in and saw the saddest and most terrified innocent faces pleading to be rescued from their and their friends’ misery. At our vigils, a group of people collectively bears witness of the pigs in the transport trucks on a busy meridian, where the trucks stop at a long set of lights before heading to the slaughterhouse. The power of collectively bearing witness is hard to describe fully because it has so many positive effects, particularly when a Gandhian love-based approach is used. There is potential for bearing witness and the Save Movement to create a truly mass-based, grassroots movement for the animals around the world. The purpose of bearing witness is to be there for the animals and show them compassion, to promote veganism and to create new activists and strengthen activists’ resolve and commitment to make the animals’ liberation a priority, to raise public awareness and action, and to persuade even the slaughterhouse workers and owners to owe up to their duty to create a nonviolent ethical, environmentally friendly, and healthy world in which all life is respected. What is amazing is how much power each of us has to make the world a better place. The Save Movement is not only about encouraging veganism but, equally important, it is to encourage daily animal activism to change the world.